October 13, 2010 (KATAKAMI) — Russia and India will conduct joint antiterrorism exercises on Indian territory on October 15-24, the Russian Defense Ministry said on Wednesday. 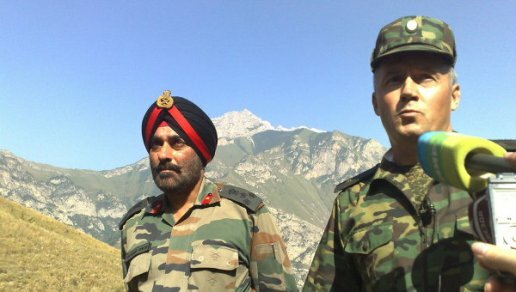 Russia is sending more than 200 troops from its 34th mountain brigade, based in the North Caucasus, to join the Indian troops in the INDRA 2010 drills. “During the upcoming exercise, the Russian and Indian military personnel will form a joint task force, and plan and carry out a series of mock antiterrorism missions in the mountains,” the ministry said in a statement. The Russian and Indian military have been conducting joint INDRA exercises, including biannual antiterrorism drills, since 2003. (KATAKAMI / NUMBER 10 GOV UK) ) Prime Minister David Cameron has travelled to India as he seeks to strengthen the UK-India relationship and promote increased trade and investment. The PM has been joined by a number of Government ministers and a high-level delegation of representatives of UK business, industry, sport and culture. We will have more information throughout the day. (KATAKAMI / GUARDIAN.CO.UK) A £500m deal for BAE Systems to supply Hawk jets is expected to be one of a string of high-profile contracts signed during the prime minister’s trip to India this week. There is also likely to be a major cultural agreement involving museums. David Cameron is taking seven cabinet ministers and a huge trade delegation with him, including representatives from BAE, Britain’s biggest defence contractor, as well as from Rolls-Royce, Standard Chartered bank, construction group Balfour Beatty and the British Museum. The prime minister wants to secure a special relationship with the emerging superpower. In a letter to the delegation, he argues that the visit is about “laying the foundations of an enhanced relationship”. He writes: “For our part, government ministers on this trip will be stressing the importance of trade and demonstrating to our Indian counterparts how Britain is open for business again. But you have a crucial role, too. In the meetings you have, the delegations you meet, places you visit, you can showcase the ingenuity and creativity our country has to offer. Barry Gardiner, the MP who chairs the all-party UK-India trade group, said India was embarking on a huge infrastructure programme. That could mean opportunities, “but we have to be careful that we don’t end up seeing what has happened in America, where companies have been bought out by Chinese sovereign wealth funds”. He also warned that India, in return, would want to win contracts from low-skilled manufacturing companies in the UK, potentially affecting jobs. “They will come back [from the trade visit] waving contracts… But there is a danger. If they get it wrong this week we could have British companies owned in India and the loss of labour in lower-end manufacturing,” he said.